Rinse and scrub sweet potatoes with a rough brush or veggie cleaner. Dry well. Coat sweet potatoes with a thin layer of olive oil. With a fork, prick sweet potatoes all over, about 6 times. Grilling instructions: Preheat grill and set burners on indirect medium heat. Place sweet potatoes in the center of the cooking grate; grill-roast until the skin is crisp and the inside is soft but the skin is still intact, about 1 hour. Remove from grill; set aside. Preheat oven to 350°F. Grilling alternative: Preheat oven to 400°F. Bake until tender but not mushy, about 1 hour. Let cool to lukewarm. Reduce heat to 350°F. To make the twice-baked potatoes: Choose the four potatoes with the most skin intact and cut them in half lengthwise. Leave a 1/2-inch margin of the potato intact, scoop out the sweet potato flesh with a spoon and place in the bowl of a food processor; reserve skins. Peel remaining two sweet potatoes and add flesh to the bowl; discard skins. To bowl add yogurt, maple syrup, chipotle, cinnamon and salt; puree until smooth. (see note) Place mixture in a piping bag or spoon mixture into reserved shells; top with goat cheese. Place on a rack over a baking sheet; bake until filling is warmed through and cheese is melty and lightly browned, about 25 minutes. 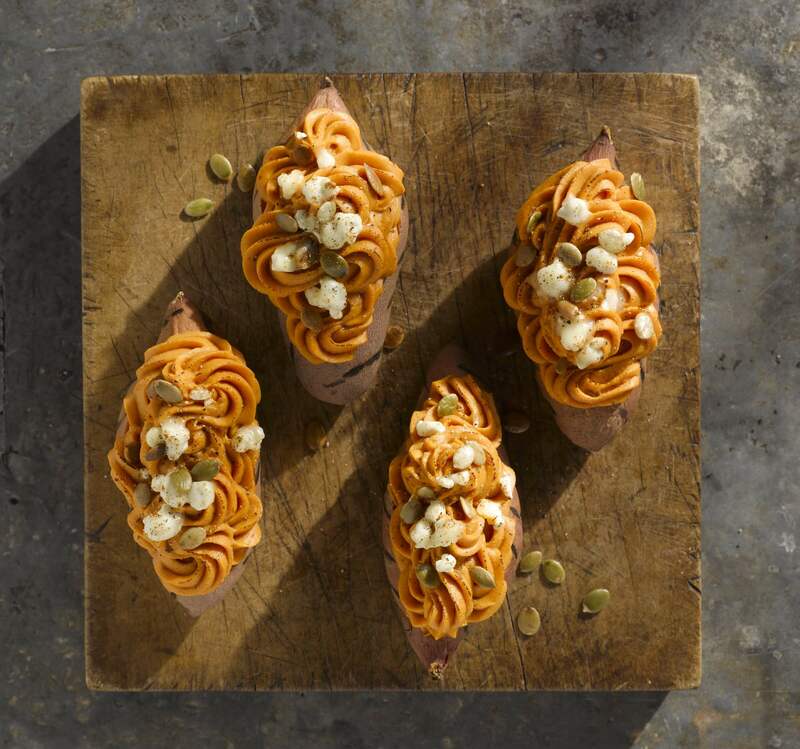 To serve, garnish with toasted pumpkin seeds. Mixture can be refrigerated for up to 2 days at this point. Follow remaining instructions and bake in oven until filling is warmed through, about 50 minutes.